Located at 12 Leadenhall Street the Lloyds building’s roots hark back to the 1980’s building boom in the city and the move towards new technologies in building infrastructure. Completed in 1986 at a cost of £75,000,000 and designed by Richard Rogers, the building is a suitable headquarters for Lloyds who have been trading since 1688. Across from Lloyds is the Swiss Re building, more formally known as 30 St Mary Axe the building was completed in 2003 and officially opened in 2004. At 180m its inspiration can be traced back to the Willis Faber and Dumas Headquarters built in 1975 by Fosters and Partners. 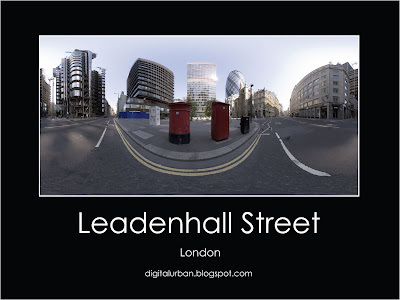 Click the image to view a larger version, view the Quicktime panorama of Leadenhall Street (2.7Mb), or view other images at the digitalurban flickr group. Andy, thanks so much for these panoramas. I’m using them in my Geography classroom, and really looking forward to the Google Earth viewer! !